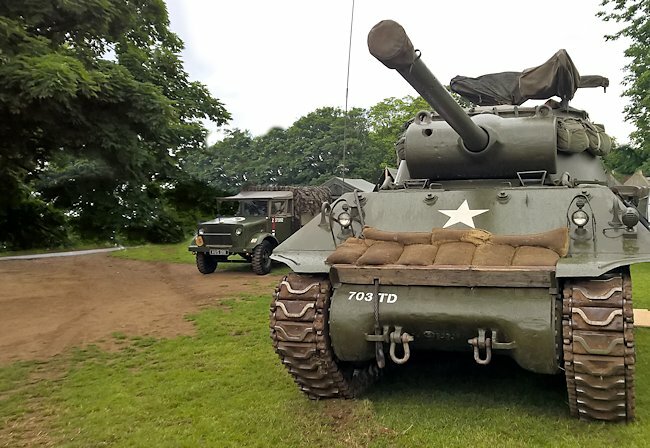 This M36 Jackson Tank Destroyer called Easy Tiger is in private ownership but can be seen at many of the military vehicle events during the summer in Britain. The 90mm Gun Motor Carriage, M36 was never called the 'Jackson' during WW2. It was given the nickname after the war by a model kit company and the name stuck. This tank destroyer is armed with a 90 mm main gun. 47 rounds could be carried on the vehicle. It was also armed with a cal.50 (12.7 mm) Browning M2HB machine gun and some also mounted a Browning M1919 machine gun . The five man crew (commander, driver and three gunners) were protected by armour that ranged between 108 mm to just 9 mm. It was 7.46 m (24 ft 6 in) long including the gun and 5.97 metres (19 ft 7 in) without the gun. It was 3.05 m (10 ft 0 in) wide and 3.28 m (10 ft 9 in) tall. It was powered by a Ford GAA V-8 gasoline petrol engine that produced 450 hp. It had a maximum road speed of 48 km/h (30 mph) and an operational range of around 192 miles before it needed to refuel. It had Vertical Volute Spring Suspension (VVSS). 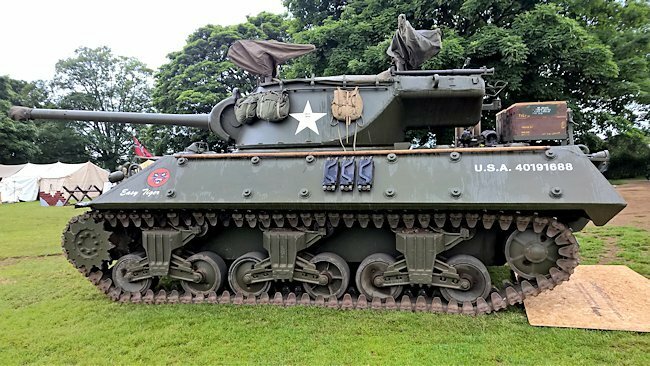 The owners believe this tank destroyer took part in the Battle of the Bulge as part of the US Army 703 Tank Destroyer Unit (703 TD). It then served in Korea and the middle east. America loaned the tank to the Israeli Army to help fight Syria and Egypt. It was then shipped back to the USA and put into storage. It was then given to the Bosnian Army where it was kept in a maintained condition. A T55 Soviet diesel tank engine was retro fitted to the vehicle in Bosnia. British tank importer Marcus Glen purchased the tank and shipped to to Britain. The present owners obtained it in 2012. 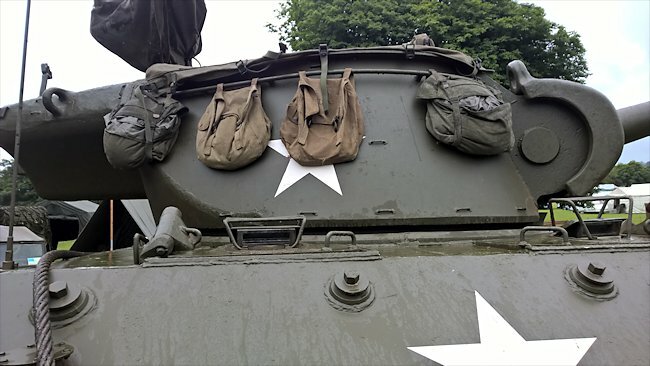 M36 Jackson crew veterans have told the owners that they did not like the metal cover that was later issued to each tank destroyer. The little slit gave a limited view of potential targets and threats. It restricted access in and out of the tank. Most crews did not use them if they had the option. The original M36 had a 90 mm gun turret on a 3" GMC M10A1 hull (M4A3 chassis): 1,298 were produced/converted. The M36B1 had a 90 mm gun turret on a Medium Tank M4A3 hull and chassis: 187 were produced/converted. The M36B2 had a 90 mm gun turret on a 3" GMC M10 hull (M4A2 chassis) powered by a GM 6046 diesel (conjoined twin 6-71s): 287 were produced/converted. The first M36 prototype was completed in March 1943. It was characterized by a new turret mounting the 90 mm M3 gun on a standard M10 chassis. 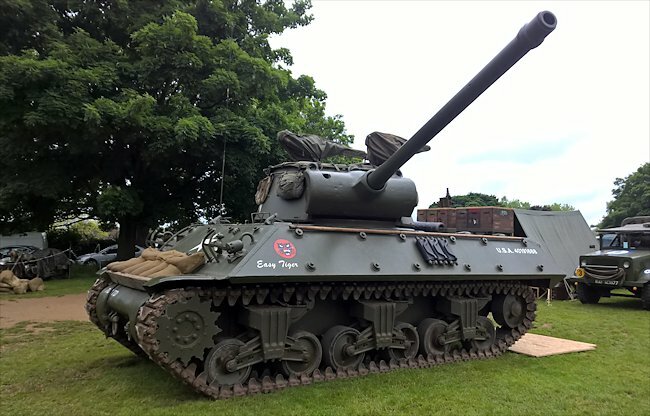 The prototype designated T71 Gun Motor Carriage passed all tests with success, proving lighter and thus more agile than the regular Sherman M4A3 and order for 500 was issued. Upon standardization the designation was changed to “90 mm Gun Motor Carriage M36” in June 1944. These were produced by the Fisher Tank Division (General Motors), Massey Harris Co., American Locomotive Co. and Montreal Locomotive Works (chassis) and hulls by the Grand Blanc Arsenal. The M36 was based on the upgraded M10A1 Wolverine hull, whereas the B2 was based on the regular M10 chassis/M4A3 diesel. 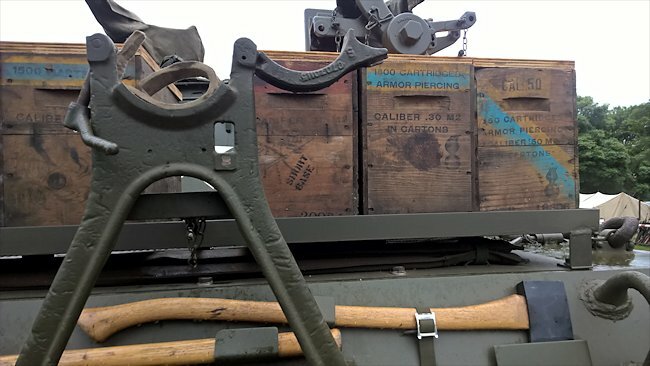 The M36 Jackson Tank Destroyer's gun lock was at the rear of the vehicle. A metal platform near the engine hatch enabled addition stores and ammunition to be tied down on the back. Like all US tank destroyers, the turret was open-topped to save weight and provide better peripheral observation. However of the turret design was not a simple repeat of the sloped plates of the M10 but rather a thick casting with front and side slopes and a backwards recline. A bustle acting as turret basket was welded on this casting to the rear, providing extra ammo storage (11 rounds) as well as acting as a counterweight for the M3 main gun (47 rounds, HE and AP). M36 Jackson crews would place a wooden plank across the front of the hull and add sandbags for additional protection.